Robbie Wilson, who has a flock of pedigree Texels at North Dorlaithers Farm near Turriff, has endured ongoing problems in fields he rents around the Turriff showground. But one incident has stood out throughout the years. He said: “A number of years ago I lost two pedigree sheep after a pair of poodles broke into their field. “They chased the flock, causing the sheep to stampede. “Two sheep broke away from the group, fell into a deep ditch and died. The incident was sadly not an isolated one as Mr Wilson said he regularly encounters sheep worrying. He said: “I’ve experienced quite a lot of minor issues relating to dogs over the years. 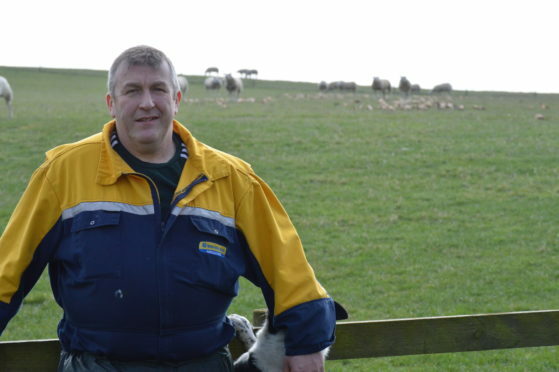 “My sheep regularly get chased, or I get phone calls from other farmers who are experiencing sheep worrying in their fields. “It can be horrendous for some farmers. I know people who have lost thousands of pounds worth in incidents. “There are signs across farmland in Aberdeenshire, warning people of the consequences of letting their dogs of the lead, but many people ignore them. Last year, Mr Wilson welcomed the launch of the North East Scotland Rural Crime & Safety Partnership, and said he hoped it would help educate the public. The partnership, which includes more than 20 partners involved in rural affairs, aims to tackle rural and remote crime in the north-east.